Itch-Eeze ® has been specially developed to meet the demand from customers for a completely natural allergy control. In fact, it is formulated without any cereals or grains of any kind, using hypoallergenic potato and pea as a source of vegetable carbohydrates. Contains Itch-Eeze ® - a unique blend of herbs which may help alleviate “allergic signs such as itching, hair loss and mucky ears”. Itch-Eeze ® natural allergy control for Dogs is a functional, daily super-premium Dog food to be fed throughout the year. The blend of herbs has been found to eradicate many allergies suffered by dogs such as itching, hair loss and mucky ears, often resolving problems where chemical treatments have failed. Protein from white fish is easily digested. 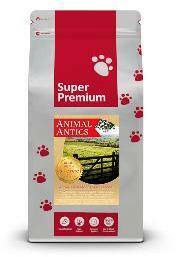 Ideally suited for dogs with delicate digestion or older dogs with slower digestive systems. 44% Fish (Salmon 18%, Salmon meal 8%, Blended fish meal 8%, Trout 7%, Salmon oil 1.65%, Salmon gravy 1.65%). Potato (Dried Potato 18% Sweet potato 18%). and Itch-Eeze ® (Including Seaweed, Green Tea Extract, Prebiotic FOS, Prebiotic MOS, Minerals and Vitamins, Echinacea, Cinnamon, Slippery Elm, Quassia, Cayenne, Common Thyme, Peppermint, Fennel, Nettle, Garlic).